40% of children in the UK who need surgery for dental problems are already known to Social Services. Experts have indicated that children with severe dental decay should be referred to NHS safe guarding teams as it could be a sign of wider neglect at home. Kings College Hospital in London said untreated tooth pain in children should ‘ring alarm bells’. There is now a new process at Kings College Hospital A&E unit for children admitted with dental infections, which sees them assessed for child neglect and also referred to a safeguarding team if deemed necessary. This process is ideally to be rolled out across the NHS over the UK. GP’s are trained to identify general neglect and now should be aware that acute dental infection can also be a sure sign of neglect. Kings looked at data of children attending hospital with a dental or maxillofacial infection requiring surgery between January 2015-2017. Over half of the children were aged between five and eight and this was identified as a high-risk group. By the time these children have been treated at the hospital they would have already suffered a long period of oral neglect and possibly pain. IN 2017 NHS Digital figures show, the hospital admissions for tooth decay amongst five to nine-year olds was 26,000. Tooth decay was the main reason for this age group to be admitted to hospital. Stats prove time and time again that the poorest children in the UK are most likely to have tooth decay over more privileged ones and the gap seems to be widening more each year. In Scotland the Childsmile programme gives parents free toothbrushes, toothpaste and oral health education information to help. Children in the most deprived areas are entitled to receive fluoride varnish applications at nursery or school. 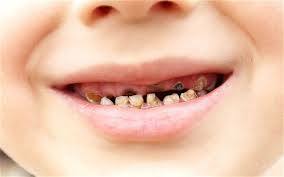 The staggering statistic shows a quarter of the children starting Primary School this year in the UK had tooth decay.